The ECOWAS Regional Electricity Regulatory Authority (ERERA) has launched the ECOLink project to boost transparency and accountability in the management of resources for institutions and agencies in the ECOWAS region. Speaking at the launch of the project last Friday in Accra, El Hadj Ibrahima Thiam, Chairman of the ECOWAS Regional Electricity Regulatory Authority (ERERA), stated that ECOLink project would enable ERERA to integrate applications that access standardized enterprise data for all ECOWAS institutions, agencies and offices. The ECOLink project was initiated by the ECOWAS Commission to harmonize and improve business processes across all ECOWAS institutions and agencies. “The project is a modernized management system with various parameters, including automated payment transaction that permit electronic processing of requisition, vetting of documents, quotations from vendors, technical evaluation and purchase orders,” the ERERA Chairman said. Some of the significant benefits of the project for ERERA include streamling time-consuming business processes, improving control over documents, reducing paper work and easing access to information. He added that through the main development vector that Electricity Power represents, ERERA was promoting interlinks between ECOWAS Members’ production and distribution plants in providing regulatory services, thereby ensuring economic efficiency and investment relevance. 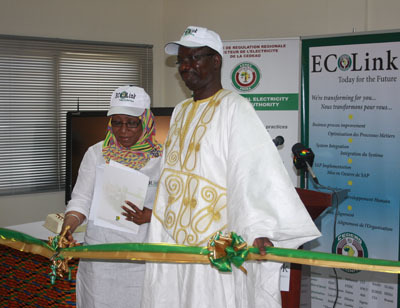 “It is therefore with pride and honour that on behalf of the president of the ECOWAS Commission and all my colleague Statutory Appointees, I wish to pay tribute to our Council of Ministers for its contribution to the initiation, conceptualization, funding and implementation of the ECOLink project, amongst other institutional reforms in the ECOWAS Agenda,” Ibrahima Thiam said. He disclosed that the project was an Integrated Management System that would reshape administrative, financial, procurement and human resources management in ECOWAS institutions and agencies, adding that it would certainly strengthen ERERA in fulfilling its crucial mandate for the benefit of the respective economies in the region.